Coveted actress Helen Mirren looked picture perfect as she stepped out in a stunning floral frock for an event in Russia this week. The 73-year-old glowed in the gorgeous black dress with flowers of red, purple and yellow embroidered all over while posing for photos at the BraVo International Classical Music Awards in Moscow. Mirren certainly stole the show in the floor-length gown which flowed gracefully to the floor. Her gorgeous smile lit up the room at the Bolshoi Theatre where stars gathered to celebrate the achievements of talented musicians. The awards ceremony brings together the best of the industry with classical performers from across the world competing for the top honour each year. They are joined by a flurry of stars such as Mirren, along with media executives and ambassadors for the special occasion. For the much-anticipated event, The Queen star chose to keep her silver locks in a slightly waved hair style with a pair of simply dangly earrings completing the look. Helen kept with the bright colour scheme, going for a pink lip and a swipe of blush on her cheeks. Her appearance in Russia comes just a week after the actress was snapped enjoying a night out with her beloved grandson. 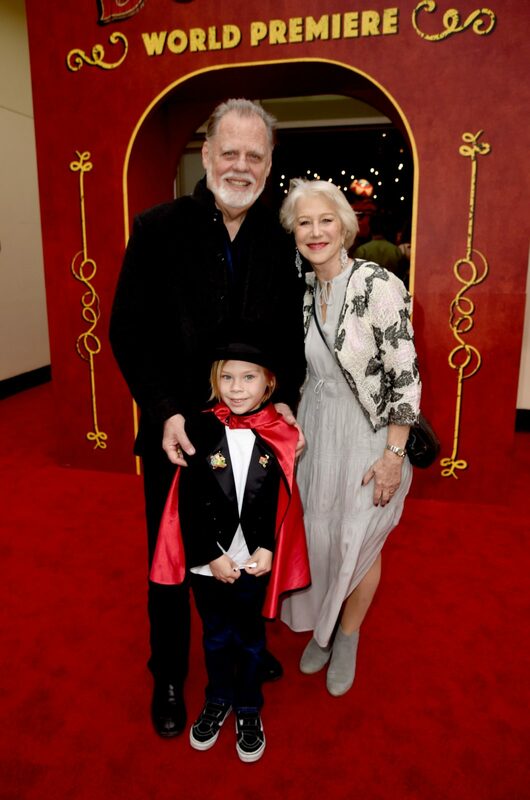 Helen was spotted out and about with her husband Taylor Hackford and grandchild Waylon at the premiere of Disney’s new live action remake of the classic tale Dumbo. The 73-year-old looked lovely in an elegant ensemble which included a grey maxi dress and matching ankle boots paired with a netted monochrome cardigan. The look was a far cry from the high-fashion dresses Helen usually dons for walks down the red carpet, but goes to show that if you’ve got the right basics in your wardrobe, you can quickly channel your own signature style without too much effort. In addition to her simple yet fashion-forward outfit, Helen completed the ensemble with a dazzling pair of pearl earrings, and kept her makeup classic with a glossy bright pink lip. Meanwhile her director husband, who she has been married to since 1997, kept it casual in black slacks and a jacket. The couple brought along their grandson, who was dressed up like a circus ringmaster with a red cape and black top hat. Are you a fan of Helen Mirren? Do you like her outfit choices?